A multidisciplinary platform for recent advances in the neurosciences. 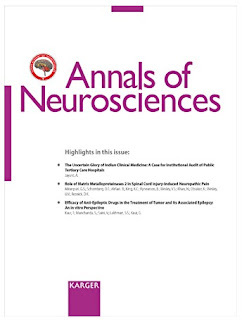 Annals of Neurosciences is a multidisciplinary peer-reviewed journal that provides an international platform for discussing recent advances in the neurosciences. As the official journal of the ‘Indian Academy of Neuro-sciences’, Annals of Neurosciences publishes wide-ranging original research results, reviews and opinions aimed at increasing our understanding of the neurosciences and encouraging the development of better diagnostic tools and effective treatments for neurological disorders. The journal brings together information on computational and experimental studies, translational research, and clinical care. Also welcomed are papers that take an evidence-based approach to arguing against accepted principles and practices. Led by an editorial team of international experts, Annals of Neurosciences is a portal for established and young researchers alike to the very latest interdisciplinary research results and perspectives in the field.